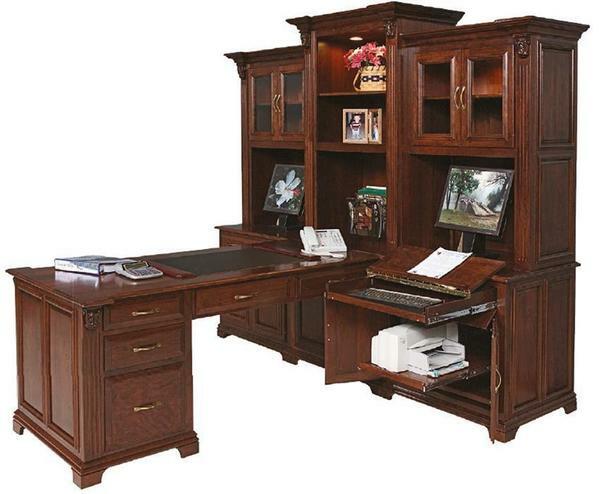 This solid wood Partners Desk is the perfect choice for you home or commercial office. The generous size of the T desk allows for ample space for two people to work facing each other. The partner’s desk first originated from the United Kingdom for use in the banking industry. The partner’s desk is also sometimes called a double desk. The functional design of the Executive Partner’s Desk is sure to enhance any décor. This desk is handcrafted by skilled Amish woodworkers. Depth including crown molding: 25"
Wall Cabinet Case Depth: 24"
Overall Depth with Wall Cabinet and Desk: 91"